SUMMARY: What are the different kinds of mammogram? The most common imaging test for breast cancer detection is the mammogram, but it’s not the only one. A mammogram is an X-ray photo of the breasts. Just as you can see the shadow of your hand on a sunny day, breast tissue creates a shadow on the X-ray. Just as you can make complicated shadows by turning your hand or overlapping both hands, so can tissue from different parts of the breast overlap in the projections to make the x-ray hard to interpret. Taking two pictures from different angles eliminates some of the problems. 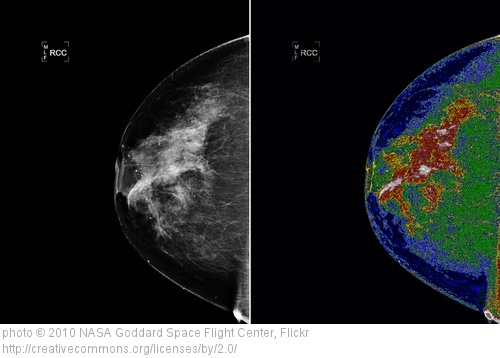 Some cancers may not be visible on the mammogram. This is called a “false negative.” Normal tissue may look suspicious on an X-ray, but turn out not to be cancer. The rate of such false alarms (false positives) is so high that about 95% of women who have an abnormal screening mammogram result do not have cancer. What are the different kinds of mammograms? Here’s a taxonomy. The image can be collected on film (film mammography) or using a digital detector (digital mammography). Digital seems a little more sensitive in women with dense breasts (see below) before menopause. Film may be slightly more sensitive in older women with non-dense breasts (details here). A “screening mammogram” is a routine mammogram done when a woman has no symptoms. A “diagnostic mammogram” is done for a reason other than screening, such as a previous abnormal screening mammogram, symptoms or signs noticed by the woman or her physician, history of breast cancer or biopsy-proven benign disease, or certain other factors. Even though the test is the same, price and insurance coverage rules may differ between screening and diagnostic mammograms. Breasts differ in the amount of denser tissue (glands, connective tissue) they contain. Some women are said to have “high breast density” or “dense breasts,” because their breasts have more glandular and connective tissue. This shows up as more shadows on the mammogram. With dense breasts, both the risk of missing a cancer (false negative) and the risk of an abnormal result in the absence of cancer are higher. For both these reasons, physicians may recommend other studies. Additional studies may also be recommended for women with higher than average risk of breast cancer based on family history, genetic testing, etc. For all X-rays, there are occasions when the film/recording is not technically good enough. The technicians taking the X-ray should prevent this. When it happens anyway, it seems fair that it’s the provider’s cost. A more common reason to do a second mammogram is that some abnormality was seen on the first one. Taking images with a slightly different angle helps decide between “normal” and the need to do yet further tests. This second mammogram can be called “diagnostic” and billed separately. For Medicare, the screening mammogram is free, but co-pay applies to the diagnostic test. Not sure it’s covered? The experts at the National Women’s Law Center write: “Health plans are required to cover, without copayments, the preventive services recommended by the United States Preventive Services Task Force (USPSTF), including annual mammograms for women age 40 and over.” There are subtleties, though; here’s a fact sheet. The American Cancer Society also has this page of resources for breast cancer screening, including a state-by-state list of laws on what’s covered. Magnetic Resonance Imaging (MRI) of the breast uses differences in magnetic properties of different tissue to form a picture. Multiple images based on magnetic properties of tissue are combined using a computer to generate images. A breast MRI is not used for screening under normal circumstances, but may be indicated in high-risk individuals, as a follow-up of an abnormal mammogram or when mammograms are not that informative such as dense breasts. A breast sonogram (ultrasound) uses sound waves from a hand-held wand to make a picture of the breast. This gives more information about any abnormality seen in a mammogram, or adds to the picture when mammograms give insufficient information. O.K., so what does this all cost? Medical practices set their list prices based on normal business concerns such as staff costs, facilities costs, etc. Medicare reimbursement rates (what the government pays for Medicare recipients) are the closest thing to a fixed or benchmark price in this marketplace. They have long been thought to constitute the low end of reimbursement rates from all payers (government, private insurers, military insurers like Tricare, Medicaid and others). Increasingly, though, we are hearing of private insurers that undercut the Medicare rates. The Medicare reimbursement rate varies with location, because different locations have different costs. A procedure reimbursed at $861 in some New York suburbs may be reimbursed at $828 in Manhattan, $675 in most of New York State and at $647 in Kansas. You can find the rates in your area in the search box on every page of our site. Most of your reports in our mammography survey come from the New York City area, which is more expensive than the national average. How can you use these numbers? First, you can look at the relative rates. Likely, these will be reflected in the price. Expect an MRI to cost seven times as much as a sonogram. Insurance companies negotiate a price with their member practices. Usually, this price will be above the Medicare reimbursement and below the list price. Sometimes, it is based on Medicare rate plus some factor, for instance 20%. These rates are not public, but when you’ve had an insurance-covered test, your insurance statement will contain the info. If you are planning to negotiate a price, look at the Medicare reimbursement rates as a floor and the listed price as a ceiling. This is Part Three of our WNYC “price of a mammogram” series. The series is outlined here.